4. Where should DNS and email servers be located? 5. VLAN1 and VLAN2 have been configured on a switch. 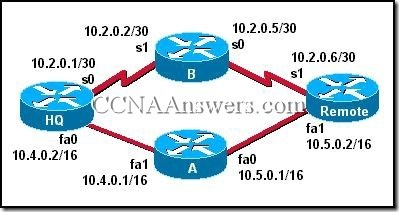 What must be done for hosts on VLAN1 to communicate with hosts on VLAN2? VLAN overlapping must be enabled on the switch. The MAC address must be added to the ARP table in the switch. A router must be configured to allow routing between the VLANs. 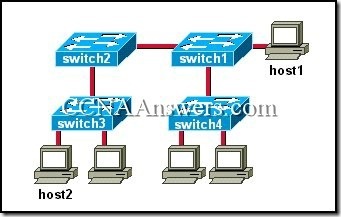 An entry in the switching table must be configured for each VLAN. Communication between VLANs is automatically enabled on switches. 6. What type of cabling is specified by TIA/EIA standards for interconnection of Intermediate and Main Distribution Facilities? 9. Why is it important that the data carrying capacity of vertical cabling be greater than that of the horizontal cable? Vertical cabling is reserved for high bandwith video conferencing. Vertical cabling carries traffic from the IDF to the user. Vertical cabling carries traffic from the enterprise out to the Internet. Vertical cabling carries traffic from multiple areas of the network. Layer-three packets move faster through vertical cabling. 14. Which LAN standard uses CSMA/CD as its access method? 15. A network administrator needs to increase bandwidth and reduce traffic on a network. What should be used in the access layer of the hierarchical network design model to dedicate bandwidth to users while limiting broadcast domains? 17. A major network upgrade that was designed to improve speed and reliability has recently been completed. Users in one part of the network are experiencing dramatically decreased throughput and loss of connectivity. Which of the LAN design goals was not met for these users? 18. When designing a LAN, at which layer of the OSI model does the process of segmenting collision domains occur? 19. Which hierarchical design model layer is responsible for containing network problems to the workgroups in which they occur? 20. What is the primary reason for implementing security and policy routing at the distribution layer?